Shovel Handle - Jackson NH and Mt. Washington Valley Area Information. 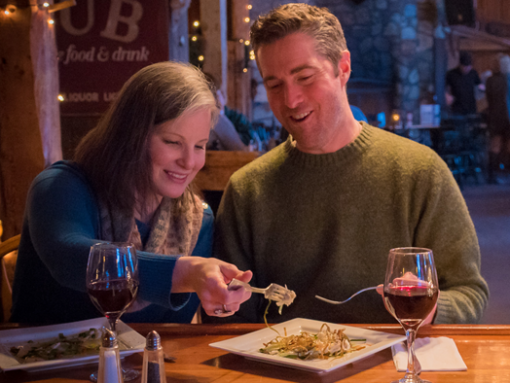 Pumpkin People, Tradionally Yours Events, Lodging specials, Dining and Ski Area Info. A favorite of locals and tourists for decades. The Shovel Handle Pub offers Yankee style cuisine to compliment the rustic charm of this 3-story post and beam barn. Marty and Pam Sweeney, previous owners of Wildcat Inn & Tavern, are chef and host of the pub and have a great reputation for quality hospitality in the valley. With views of Black Mountain Ski Resort out our windows, sit fireside under “Whit”, our moose mascot, and enjoy three levels of dining.